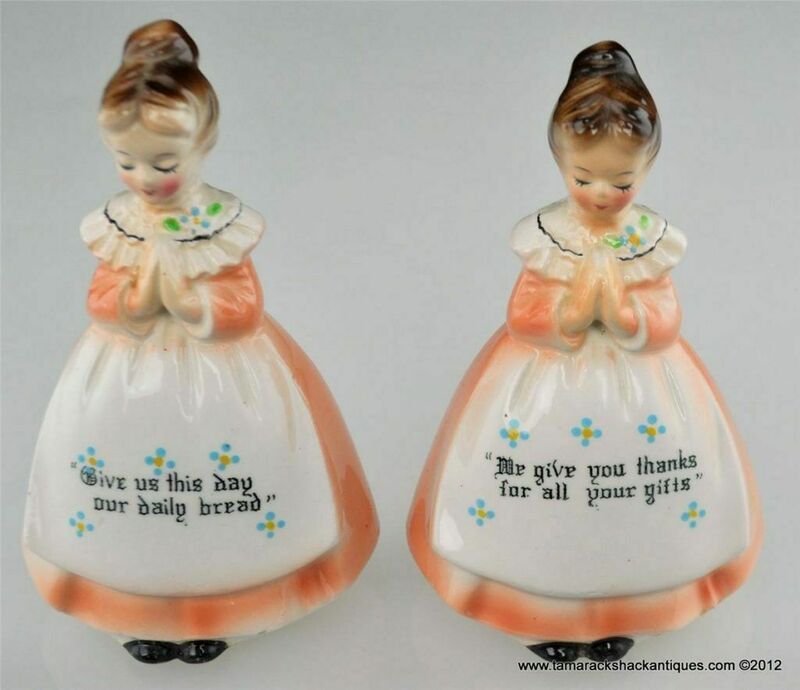 For your consideration is this Praying Girl Salt & Pepper Shaker Set by Enesco Japan. The girls are in Pink Dresses and have Light Brown Hair. Their heads are bowed and their hands are folded. They are both marked on the base with a sticker that reads Imports Enesco Japan as well as a mark that reads E-3348. Both of the shakers have the stoppers. One girls dress has the words “We give you thanks for all your gifts” and the other one says “Give us this day our daily bread.” The one with the words “give us” has two holes in the back and is the pepper shaker. The other has three holes and is for salt. The paint is in nice shape and there are no chips or cracks. Please see the pictures for more detail.